Make this delicious side dish recipe for Praline Sweet Potatoes for Thanksgiving! Because it cooks in your crockpot, your oven and stovetop are free for the other recipes on your menu. 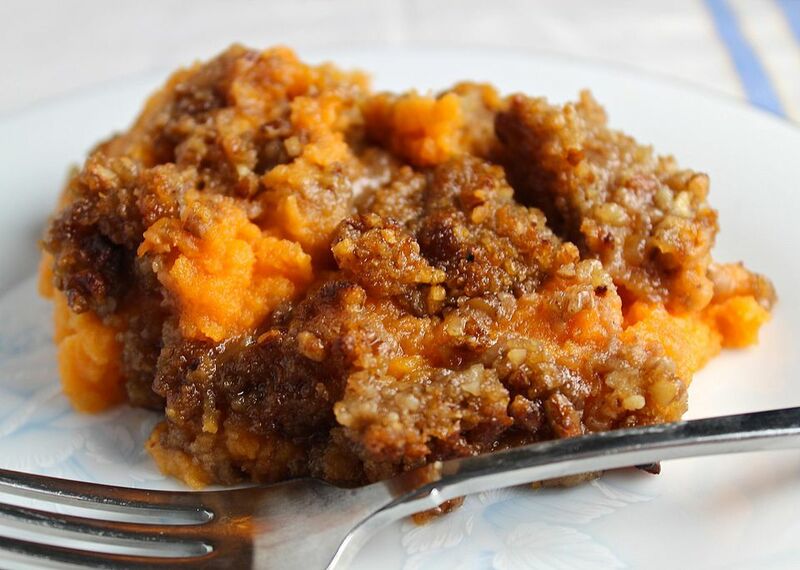 There's something so wonderful about the combination of sweet potatoes, brown sugar, and a streusel topping. Sweet potatoes can be cloyingly sweet, but in this recipe they are just right. The applesauce adds a bit of sweetness and also a bit of tart freshness to cut through the denseness of this recipe. And the granola topping is super easy to make and adds a wonderful crunch and the perfect flavor. Use your favorite granola in this easy recipe. Serve it with roast turkey, of course, mashed potatoes, stuffing, and gravy, the traditional Thanksgiving meal. And enjoy every bite! Cut the potatoes into 1" chunks and place in a 4-quart crockpot. Combine the brown sugar, 1/4 cup butter, cinnamon, and applesauce in a small bowl; blend with a spoon and then pour over the potatoes. Cover the crockpot and cook on low for 6 to 8 hours or until the potatoes are tender. Mash the sweet potatoes using a potato masher right in the slow cooker, leaving some chunks for texture. At this point, you can cover the potatoes and turn the slow cooker to low. They can stay this way for a few hours. When you're ready to serve, melt the remaining 1/4 cup butter in a small skillet and add the granola and the pecan pieces. Cook over low heat for 5 to 6 minutes until fragrant. Sprinkle this mixture over the sweet potatoes and serve.